Located in Shidu (shí dù 十渡) and Zhangfang Town (zhāng fáng zhèn 张坊镇) in Fangshan District (sháng shān qū 房山区), Beijing, Shidu Scenic Area is 96 kilometers away from the city. 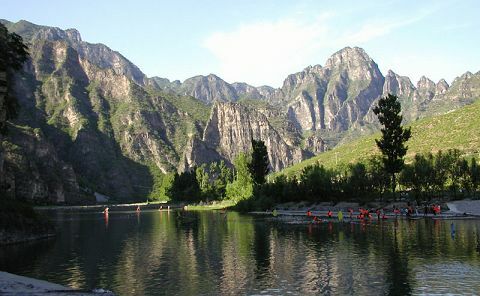 It has the largest and most typical Karst valleys in north China and is the closest scenic spot of its kind to Beijing. Renowned as Green Mountains and River, Hundred Li Art Gallery, it has twelve geological landscapes such as the Flying Rock, Chinese character Buddha in the Dragon Mountain, Rock in a Rock and more. The Juma River winds its way across the mountains like a jade belt, and sets off the peaks. The landscape here combines the majesty of north and the grace of south China. Shidu Scenic Area was designated as one of the Sixteen New Scenic Spots in Beijing in 1986, one of the first batch of Scenic Areas in Beijing Municipality, National AAA Tourist Attraction in 1999, and approved as National Geological Park in 2004. 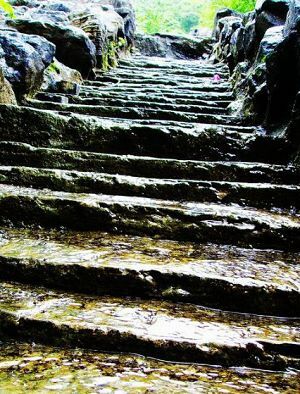 10 scenic spots: Orphaned Mountain Village, Immortal Peak Valley, Ten-Thousand Scenery Immortal Ditch, Big Canyon of South, Pu Du Mountain Village, Martyrs' Cemetery of PingXi Resistance Against Japan, Immortal Dwelled Cave, Mountain of Pond in the Sky, West Lake Ferry, and Five-Star Gorge. 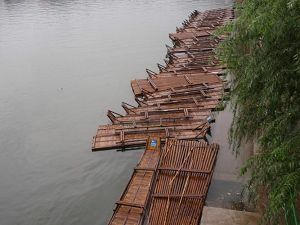 Entertainment spots: JuMa Paradise, Nine-Ferry Drifting, Eight-Ferry Boat Paddling, Six-Ferry Boat Paddling, and Qingjiang Nine-Dragon Deep Pond and so on. They provide extreme jumps, cliff parachuting, ropeway, crag climbing, sky gliding, drifting, boat pedaling, canoeing, vehicle surfing, motorboating, sand beach bathing, swimming, horse riding and many other programs. Hotels: Including Shanguang Guesthouse, Buddha Gazing Mountain Villa, YanAn Training Center, Pen Holder Mountain Villa, the Bureau of Finance Training Center, and other middle scale or upscale guesthouses. There are also 11 travel focused villages such as Xizhuang Folk Custom village, Western River Fish Culture & Angling village and others that offer 5600 berths, provide coordinated services like travel, accommodations, food, shopping, and entertainment. 3. Take train 7 from Beijing's South Station ( 北京南站) and get off at Shi Du; 4. There are mini buses and carriages inside the scenic area. 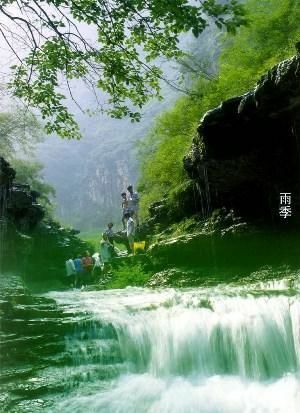 Admission Ticket: 20 Yuan for Gushan Village, 15 Yuanfor Wanjingxiangou, 20 Yuan for Xianfeng Valley. Time: June 1st to October 10th. Content: diving, sun bathing, boating, whiffing, beach valleyball, singing, needfire evening, dancing and performances.